Having a bigger family with some little ones, it’s sometimes hard to get to go out to dinner. We were lucky enough to be treated to a preview of Mimi’s Cafe’s special Mother’s Day menu. 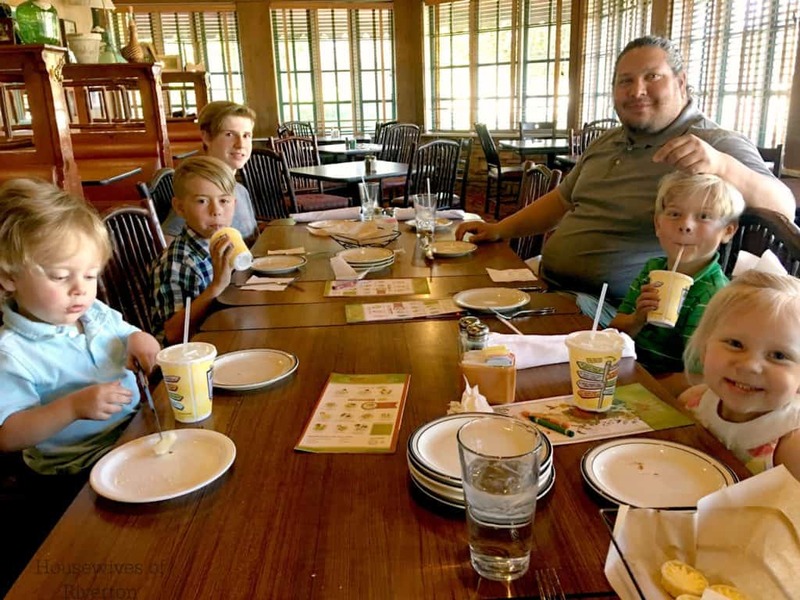 We were given the opportunity to sample the Mother’s Day menu at Mimi’s Cafe. All opinions are 100% our own. 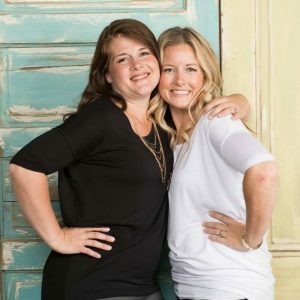 Starting at 11am, Mimi’s will offer their 3 course Mother’s Day menu. For $18.99, you start with a Caesar salad, House salad or Cup of soup for course one. We tried the Caesar salad, French Onion soup and Tomato Basil soup. They were all so good. I have to say the Tomato Basil was so creamy and flavorful, it was an instant favorite. For course two, you’ll choose from six different entree options. Mimi’s Mother’s Day menu is full of delicious options. 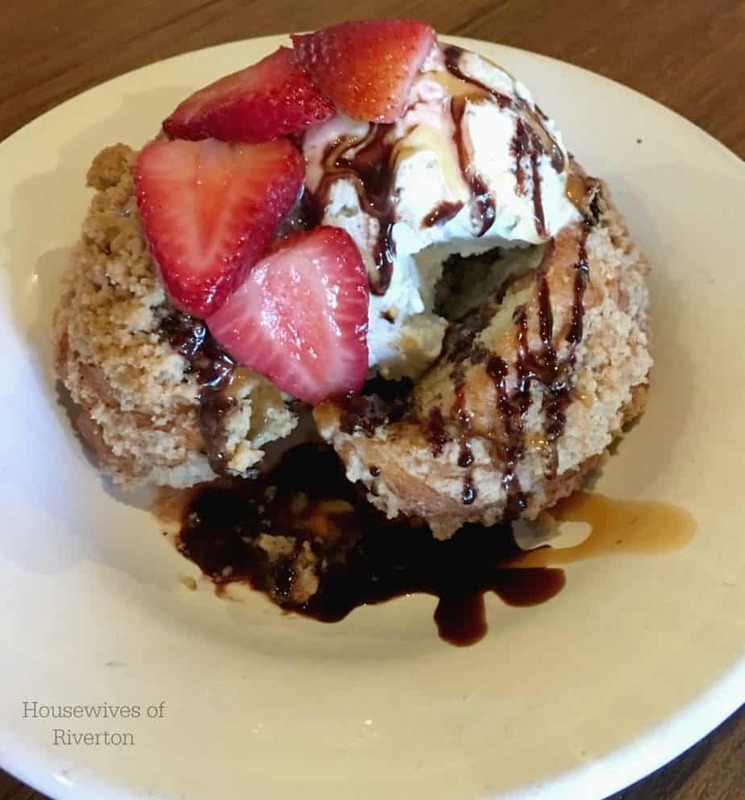 In addition to the Mushroom Brie Burger and the Slow Roasted Turkey that we tried, the menu also includes; Quiche Lorraine, Shrimp Brochette Skewers, Chicken Chop Salad, Chicken Tillamook Cheddar Mac. There is literally something for every taste. It was SO hard to make a decision because everything looked so amazing. The Mushroom Brie Burger was perfect. The melty cheese with the caramelized onions and mushrooms paired perfectly together. The Slow Roasted Turkey was exactly what you would want for comfort food. The turkey and gravy were amazing, and having the tradition sides of dressing, mashed potatoes, and orange cranberry relish was wonderful. My son was literally eating the relish with a spoon! Course three rounds out the meal with a delicious and decadent dessert menu. 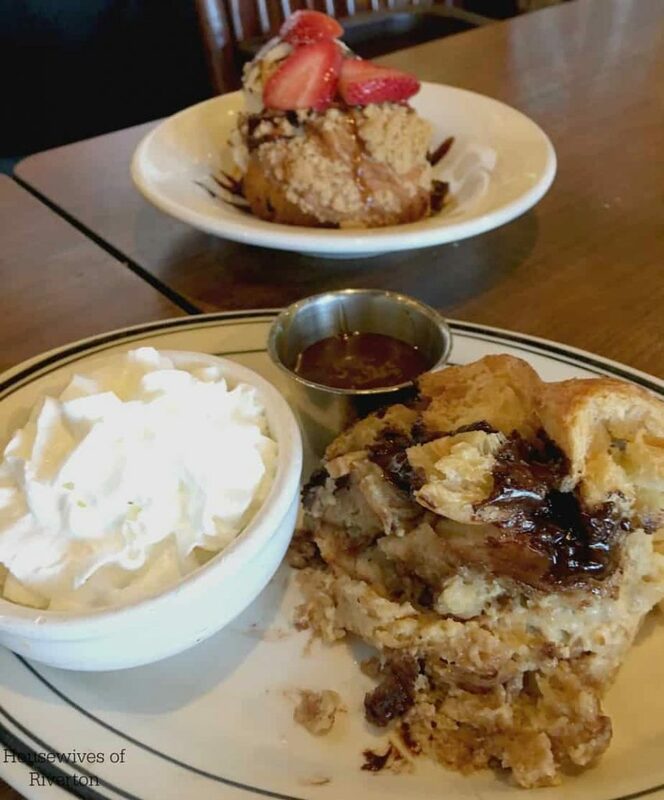 Mimi’s serves up a Seasonal Muffin Sundae or a Chocolate Chip Croissant Bread Pudding. Of course we decided to get one of each! We got to try the Banana Split Muffin Sundae and the Bread Pudding. Heaven help us. There were 7 of us to share these and we couldn’t even finish. They are so rich and tasty that you could eat yourself into a lovely dessert coma! Now, because we had little ones with us, Mimi’s had their kid’s menu in full swing too! There are a ton of great options that are new and exciting, but just familiar enough for kids to know it’s something they will like. Hudson got the Peanut Butter and Jelly Crepes, he thought it was the coolest thing in the world! He felt brave ordering something new, and we were happy to know that it would be something he would eat and enjoy. 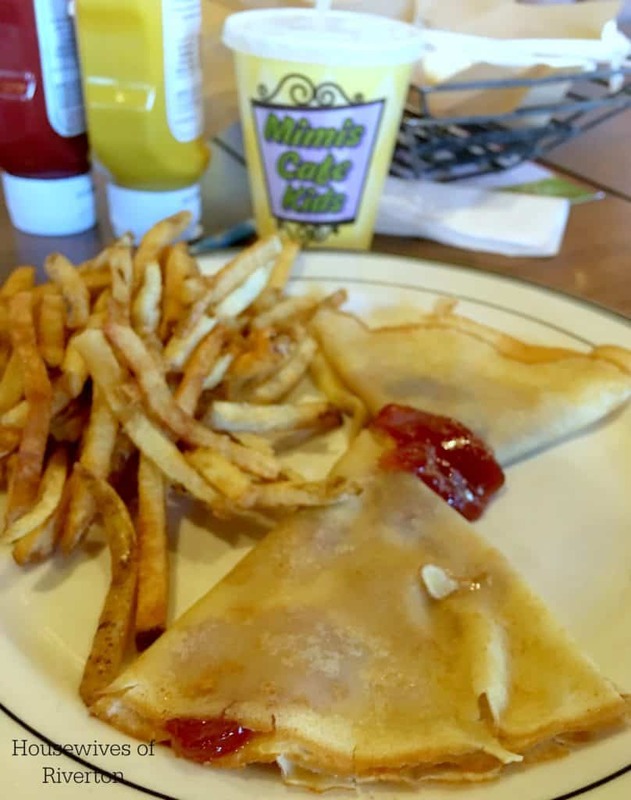 Mimi’s Cafe is known for their French Inspired American comfort food. So they are going to spoil us not only on American Mother’s Day, but will also invite guests who dine with them on Mother’s Day back for a FREE entree from May 15th through May 28th which is Fete des Meres (Mother’s Day) in France. * I mean, if we’re going to spoil our mothers, lets do it right and celebrate all month long! 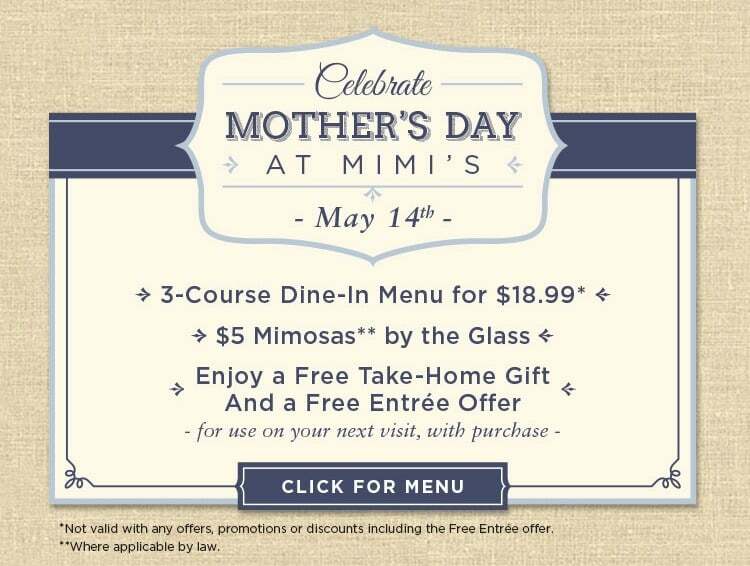 So make sure you get over to Mimi’s Cafe to enjoy a delicious and special meal with the mothers in your life! Find the nearest Mimi’s to you by clicking here.